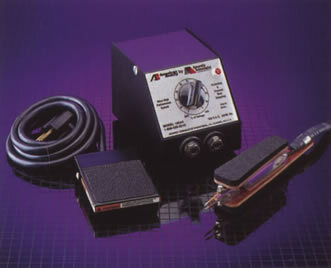 Resistance Soldering offers the ability to solve difficult soldering applications with intense, localized heat. Now, American Beauty offers the ability to attain more consistently repeatable solder joints by controlling the application of this intense heat with our new Precision Timer Module. At last...resistance soldering and tight operating parameters can go hand-in-hand. Please take a moment to examine our Model 105PTM Resistance Solder Precision Timer Module. Description: This System consists of a Model 105A3 100 Watt Power Unit, a Model 10541 Regular Tweezer Style Handpiece and a Model 10519 Footswitch. 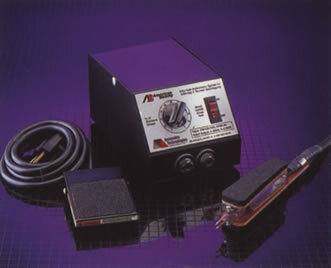 Uses: This System may be used for a wide variety of delicate soldering applications. These uses may include, but are not limited to, micro-miniature setups, wire processing, terminations, small assemblies, multi-pin connectors, model railroading applications, printed circuit board components, prototyping and many more. Power Unit Description: The Model 105A3 Power Unit, has a low-voltage, high amperage, variable output, isolated transformer. The output voltage is 0 - 2.65 VAC (with no load). The control knob reads 0 to 100% of output voltage. This Power Unit may be adapted to automated and fixtured production tooling. For more detailed information please read the Information/Instruction sheet specific to this Power Unit. Handpiece Description: The Model 10541 Handpiece is a Tweezer style, dual stainless steel electrode, Handpiece. It is supplied with two stainless steel, (.078" x 1½"(1.98 mm x 38.1 mm)) electrodes for small and micro soldering applications. It has a four-foot (1.22 m) 14-2 HPN neoprene cable, with taper pin quick connect terminals for fast, easy connection to the 105A3 Power Unit (push in turning clockwise until snug) and padded handles for operator comfort. It is most often used to provide instant localized heat to create accurate, trustworthy solder joints in delicate soldering applications. For more detailed information please read the Information/Instruction sheet included with the Handpiece in this Kit. Footswitch Description: The Model 10519 Footswitch is a rugged, industrial switch, (wired normally open), with a six-foot (1.83 m) 18-3 SJT cord and NEMA 5-15 P/R piggyback style plug/receptacle. 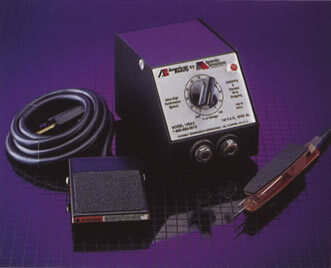 This footswitch is often used, to better control the cycle time needed for an application. Description: This System consists of a Model 105A12 250 Watt Power Unit, a Model 10541 Regular Tweezer Style Handpiece and a Model 10519 Footswitch. Uses: This System may be used for a wide variety of standard soldering applications. These uses may include, but are not limited to, wire processing, terminations, fiber optics, standard multi-pin connectors, electrical and electronics work, small assemblies, model railroading applications, printed circuit board components, prototyping and many more. Power Unit Description: The Model 105A12 Power Unit has a low-voltage, high amperage, variable output, isolated transformer. The output voltage is 0 - 2.8 VAC (with no load). The control knob reads 0 to 100% of output voltage. This Power Unit may be adapted to automated and fixtured production tooling. For more detailed information please read the Information/Instruction sheet included with the Power Unit in this Kit. Handpiece Description: The Model 10541 Handpiece is a Tweezer style, dual stainless steel electrode, Handpiece. It is supplied with two stainless steel (.078" x 1½"(1.98 mm x 38.1 mm)) electrodes for small and micro soldering applications. It has a four-foot (1.22 m) 14-2 HPN neoprene cable, with taper pin quick connect terminals for fast, easy connection to the Model 105A12 Power Unit (push in turning clockwise until snug) and padded handles for operator comfort. It is most often used to provide instant localized heat to create accurate, trustworthy solder joints in standard sized soldering applications. For more detailed information please read the Information/Instruction sheet included with the Handpiece in this Kit. Description: This System consists of a Model 105A12 250 Watt Power Unit, a Model 105127 Medium Tweezer Style Handpiece and a Model 10519 Footswitch. Uses: This System is excellent for medium to fairly large resistance soldering applications including but not limited to; antenna leads, semi-rigid coaxial cable connectors, wire processing connections and terminations (up to 1/4” (6.5mm) diameter) heating filling and connecting solder cups in multi-pin connectors (up to 10 gauge) lugs, posts and working on light bus-bar applications. Handpiece Description: The Model 105127 Handpiece is a Medium-duty, Tweezer style, dual stainless steel electrode, Handpiece. It is supplied with two stainless steel, (1/8" x 3"(3.2 mm x 76.2 mm)) electrodes for medium sized, soldering applications. It has two, four-foot (1.22 m) 10 AWG high-stranded DLO cables, for flexibility, with taper pin quick connect terminals for fast, easy connection to the Model 105A12 Power Unit (push in turning clockwise until snug) and padded handles for operator comfort. It is most often used to provide instant localized heat to create accurate, trustworthy solder joints in heavier soldering applications. For more detailed information please read the Information/Instruction sheet included with the Handpiece in this Kit. Description: System Description: This System consists of a Model 105A3 (100 watt) Power Unit, a Model 105133 Micro-Tweezer Handpiece and a Model 10519 Footswitch. 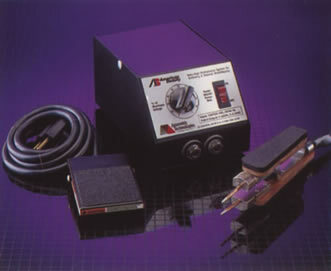 Uses: This System may be used for a wide variety of delicate soldering applications. These uses may include, but are not limited to, micro-miniature setups, fine AWG wire processing, terminations, very small assemblies, multi-pin connectors, model railroading applications, printed circuit board components and various micro-soldering applications where space constraints may exist. Power Unit Description: The Model 105A3 Power Unit, has a low-voltage, high amperage, variable output, isolated transformer. The output voltage is 0 - 2.65 VAC (with no load). The control knob reads 0 – 100% of output voltage. This Power Unit may be adapted to automated and fixtured production tooling. For more detailed information please read the Information/Instruction sheet included with the Power Unit in this Kit. Handpiece Description: The Model 105133 Handpiece is a Micro-Tweezer style, dual Electrode, Handpiece. It is supplied with two nickel-chromium (.040” x 1/2 ”(1 mm x 12.7 mm)) Electrodes for small and micro soldering applications. It has a four-foot (1.22 m) 18-2 HPN, neoprene cable, with taper pin quick connect terminals for fast, easy connection to the 105A3 Power Unit (push in turning clockwise until snug) and padded handles for operator comfort. It is most often used to provide instant localized heat to create accurate, trustworthy solder joints in delicate soldering applications. For more detailed information please read the Information/Instruction sheet included with the Handpiece in this Kit.